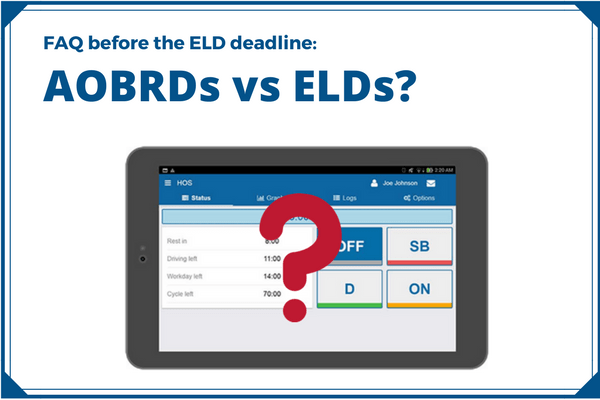 One of the hottest questions as the ELD mandate deadline approaches is what is the difference between AOBRDs vs ELDs. 1 – What is an AOBRD? 2 – Why do some fleets use AOBRDs? 3 – Is Geotab Drive an AOBRD or ELD? 4 – Why are ELDs the future of trucking? AOBRDs, short for Automatic On-Board Recording Devices, are devices that electronically record driver hours. Wait a minute! Isn’t that the same thing as ELDs? Sort of. 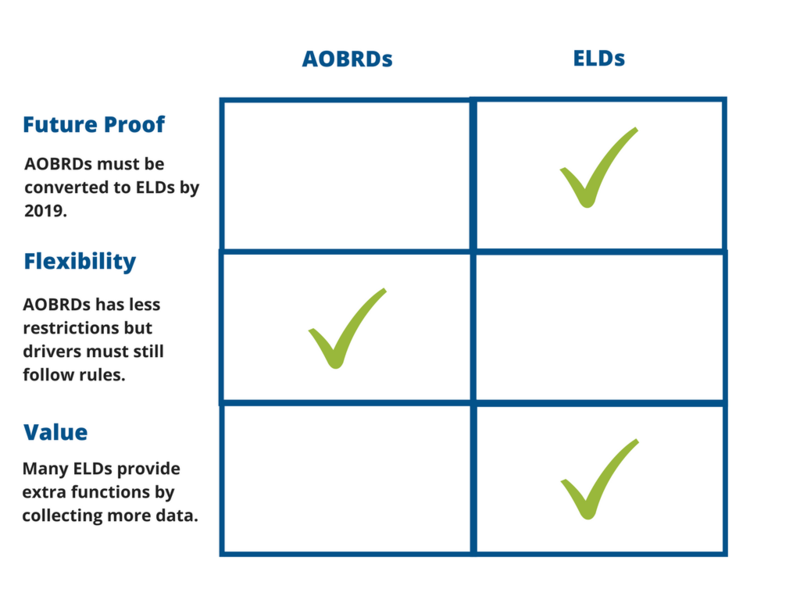 An AOBRD is similar to an ELD but they are not quite the same. AOBRDs are compliant with 1988 regulations, whereas ELDs are compliant with modern mandates. In the future, all AOBRD users must upgrade to ELD solution. One of the big differences of AOBRDs vs ELDs is compliance. Editing. The FMCSA understands that sometimes there are mistakes and that drivers need to edit their hours. An AOBRD can edit hours, sometimes without leaving a trail. An ELD, on the other hand, protects data integrity by keeping a record of all edits. On duty switching. ELDs switches driver status from Off to On Duty if the truck stopped for over 5 minutes. AOBRDs do not. Unassigned hours. ELDs also warn drivers of any unassigned hours upon logging in, whereas AOBRDs do not. As a result, ELDs give drivers the flexibility of noting if they drove the truck or if someone else drove the truck. The ELD mandate’s grandfather clause is stirring the debate between AOBRDs vs ELDs. The grandfather clause allows fleets to use AOBRDs for the next two years if it is bought before the deadline. However, after December 16, 2019, all AOBRDs must be upgraded to ELDs. Geotab is committed to using ELDs. With the recent November 2017 update, the Geotab Drive program was upgraded from an AOBRD to an ELD. AOBRDs are a band-aid solution. It helps fleets avoid penalties today but fleets are still responsible for switching to full ELDs later. Instead of delaying the change, a lot of fleets are getting in full compliance. One of the biggest mistakes of getting AOBRDs instead of ELDs is trying to take advantage of the AOBRD’s flexibility. Yes, it is true that drivers can edit their logs without leaving behind a paper trail. At the end of the day, however, drivers are still responsible for following the law. If DOT inspectors find that logbooks are tampered and hours are violated, the driver and company is still liable for penalties. Another big difference between AOBRDs and ELD is that ELDs collect more data than AOBRDs. This allows ELDS to provide more functions. For example, a lot of ELD programs also offer IFTA reporting, diagnostics, and driver coaching. Read our Comprehensive Guide To ELD Compliance. Click here for more information on ELDs. Geotab: What is an ELD?